Several weeks ago, at a meeting of the Washington Island Archives, Archivist Janet Berggren brought to our attention a carving inside a glass case. This item had been passed along from the Island Library, where it had been on display for a number of years. No one seemed to immediately know what it was, or its significance, although a hand-lettered label on card stock inside the box said, "To Icelanders of Washington Island from the Icelandic Association of Chicago." The glass case, approximately 16 inches high by one foot square, held what appeared to be a carved sperm whale tooth, mounted on a wooden base with descriptions of the two carved figures, one on either side, inscribed in a brass plate screwed to the wooden base. On one side: Gudmunder Gudmundsson 1840-1938, and his wife (we assumed) Gudrun Ingvarsdottir (1842-1940). The carving had been set loosely on a piece of what appeared to be dark sheepskin, wool side up, a very dark brown color the shade of which can be found in some Icelandic sheep. The glass case had a light brass hasp, and to ensure no one messed with the carving, it had been secured with a hardened Masterlock padlock. No key came with it. The following week, I brought a hacksaw in an attempt to cut the lock. No dice. I then located a bolt cutter and the lock was removed. At closer inspection of the carving, it did indeed appear to be a sperm whale's tooth, carved by someone with the moniker "Dory." This name and date '70 was carved into the underside of the wooden base, and "Dory" was also carved on one side of the tooth. The wooden base on which the tooth was mounted (glued, it appears) had the relief of Iceland, with columns carved vertically into the sides representative of basalt columns found in the landscape of Iceland. Janet searched the Archives Index for related articles and found that a large celebration had been planned for June 1970, and that a request had been made in one news article for available rooms to host guests, and that some 400+ pounds of whitefish were on order for a fish boil. Several Icelandic dignitaries were expected to be present, including a man who at the time was the Chicago manager for Icelandic Airlines. But no news photo or direct connection was made of a carved gift from Iceland, through the Icelandic Association of Chicago. While we became convinced this had been given to Washington Island, perhaps accepted by the Town's Chairman, who the carver was remained to be determined. The rather stern faces carved in the tooth looked similar to ones I had seen in a museum in Selfoss, Iceland, when we traveled there with a large group in 1987. Ted Jessen had then led us to the Halldor Einarsson museum of carvings, the same man who carved Thordarson's furniture. Jessen held up two carved wooden figures, almost exactly the same as the faces carved in the whale's tooth. Einarsson left his Chicago area home and returned to Iceland to spend his later years. He took with him many carved pieces from his personal collection. He then funded and established a museum in Selfoss to house them. Einarsson died in 1975, so that with good health he could have in fact carved this commemorative piece - whether commissioned, or as his personal donation. But, it was a few days later when I made the association between Halldor Einarsson and "Dory." On several of the sketch pages found in one of Thordarson's notebooks, there appeared the stylized name "Dory," with the tail end of the "Y" extended beneath the other letters. Dory was Einarsson's nickname, it appears, or at least the abbreviated way he signed his work. In my book, I had attributed Thordarson's notebook sketches (dated 1931) to someone who had gained Thordarson's trust, quite possibly his oldest son, Dewey, who studied to be an artist. Whoever that person was, he had been authorized to expand upon Thordarson's creative ideas in those personal pages. Carver Einarsson would have earned that trust, through his successful interpretation of Norse mythology in the furniture he carved for Thordarson's Chicago office, later moved to the Rock Island boathouse. What has not yet been decided is the ultimate disposition of the gift to "Icelanders of Washington Island" that now resides in the Archives, since the Archives mission relates to care of documents and photos, not artifacts. It would seem the Town of Washington, recipient, should display this piece it where it can best be seen and appreciated, not lost or relegated to a storage room. Its value lies more in its cultural connections rather than monetary value, although Icelanders who venerate his work might look differently on this Einarsson artifact. View from the ranks as Legion Color Guard led procession to the Island Cemetery Monday morning. Visitors and residents of Washington Island enjoyed a near-perfect Memorial Day Weekend, with fine weather Friday through Monday. Nearly any outdoor activity could be enjoyed, except for swimming or laying on the beach, since just one month ago the ice was leaving our harbors and the lake water is too cold for swimming. The traditional Memorial Day Program with ceremonies at the cemetery and School House Beach afterward, sponsored by the local Gislason-Richter American Legion Post 402, was held at Bethel Evangelical Free Church. Student Americanism Essays were read, selected war poems were recited by men of the Post, and the community turnout and support was again gratifying. Approach to Rock Island, Saturday, May 25. With the holiday over, we returned immediately to cooler, wetter weather Tuesday morning. This year, with the addition of the small passenger ferry Karfi to the Ferry Line Fleet, I am under instruction with Jeff Cornell, who practically trained as a toddler under his Grampa Jim Cornell years ago. Although a small vessel, rather straightforward in many ways, nevertheless there are characteristics and idiosyncrasies in this ferry not found on the larger vessels in Detroit Harbor. This change of scenery is a welcomed one for me, and propitious, too, as I am just completing a book under the title, Thordarson and Rock Island. This is a coincidental convergence of my earlier goal of completing this local history book, with the recent and unplanned acquisition of the Karfi by the Ferry Line company. I am now allowed the pleasure of working a few days each week on the Rock Island run. After reading intently and organizing letter and document materials that were Thordarson's, with a steady, concentrated writing effort since January 1st, it is now a pleasure to set course for the Thordarson's stone edifice, the Rock Island State Park Boathouse. It is Thordarson's best known structure and a most convenient point on which to steer when departing Jackson Harbor. Jeff is particular as to how his operation should be managed, following years of safe and reliable transportation. I'm slowly gaining the needed skills. If Jeff is to get his day off each week, my improved abilities will give him that opportunity. There are two contrasting photos shown here of the Karfi's recent operations. One was taken Saturday on the noon trip to Rock Island. The other was yesterday morning when we had cool temperatures and a light rain. I'm amazed, given that weather, that we had any passengers for a day of hiking and exploring on Rock Island. It shows the possibilities when sunnier, warmer days arrive. What is this vessel at the boathouse dock? Photos of at least half a dozen different vessels of substantial length shown at the Rock Island dock are archived in the Thordarson collection. Here is another head-scratcher, as it doesn't look at all familiar as a Washington Island vessel. "Well, that's not too hard a mystery. That looks like the Marold II, originally Alexander Winton's yacht LaBelle. He was a Cleveland industrialist, early in the auto and engine business. The yacht was sold and eventually converted to a freighter in 1925. It was owned by the Hill family from Fish Creek and elsewhere, including Washington Island, and ended her days when they were salvaging gasoline off a tanker grounded across the lake near Beaver Island. That explosion in 1937 finished her off. 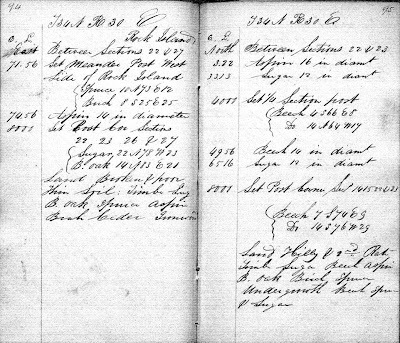 I've included the data sheet from the archival collection at Bowling Green, which has a picture of it as a freighter, but not in the original configuration. "The internet has slowed to a crawl here, but I hope to find an appropriate picture to include. --- It is now "later" and while the internet is somewhat faster I was unable to find a picture of the LaBelle as the LaBelle. However, if you discount the cabin in the photos, the hull us very much like many of the early, large steam (and in this case gasoline / diesel) yachts. Long, low, skinny, with masts and a central stack. "There were quite a few of these yachts put to use. The Thistle of the Hart Line was one, and another was the Winyah that ran the north shore of Lake Superior to drop off supplies at commercial fishing camps and bring the fish to Duluth for shipment to market. that boat had been Andrew Carnagie's yacht." Part of the explanation for my blogs being intermittent this winter, even though I officially consider myself "half time"at the Ferry Line office and therefore partly retired, is that I've been working on a history I'm calling Thordarson and Rock Island. For nearly seven years, off and on, I've collected Thordarson information. I've transcribed letters into computer files and written original text about them. During this process I've discovered many surprising connections, and each involves a side trip from the main subject. This is one of the pleasures of the process, but side trips also become another reason for the time it takes to put it all together. I've made announcements about finishing this projects to others before, partly to spur myself to meet a deadline. I didn't realize I had so much ground yet to cover. But now, I think I'm really getting close to a draft that's readable and "almost" error free. Spring is upon us, according to the solar calendar, and summer's not far off. I need to wrap this up before time runs short, with work and distractions aplenty. Thordarson came in contact with many fascinating people, and a good number of those associations are supported with documents, primarily letters. I won't post information here that will appear in the book, but there are plenty of other things to write about. In this blog I thought I'd post a few old boat photos. These were found in the Thordarson files at the Island Archives, and I'd guess that either Thordarson or a family member took them as these boats came into the Rock Island pier. According to one letter, an early pier was under construction around 1914 so that he and his workers would have a safe place to land, unload materials, and moor a boat. No names or dates were printed on the reverse side of these photos (typical and unfortunate, because this is the case for nearly every Thordarson photo). I contacted friend Eric Bonow, who recently reported back aboard an ore boat at Bay Shipbuilding to start the 2013 sailing season. Eric always enjoys unraveling a mystery. He's collected maritime ship images and he also searches collections belonging to others in order to identify vessels. In the first photo shown is the steamer Saugatuck. It's moored alongside Thordarson's pier, perhaps after discharging freight and maybe Thordarson himself, who found it convenient to take a train from Chicago to Escanaba, then a boat across upper Green Bay to his island estate. The Saugatuck eventually wound up in Chicago where it was abandoned and sunk in the North Avenue Basin of the Chicago River. Later, it was scuttled (intentionally sunk to get rid of the old hull) in Lake Michigan. Eric wrote that the Hyacinth (160.6 x 28 x 14) was a predecessor to the familiar Coast Guard buoy tenders (Sundew, Mesquite, Acacia, etc.) we used to see in Green Bay waters. And although we can only guess at the dates on these two vessel stops at Rock Island, it seems to fit in, more or less, around 1920. The Hyacinth was built in 1907 by Jenks Shipbuilding, Port Huron, as a lighthouse tender under the Dept. of Commerce, U. S. Light House Service. The vessel likely was making a call at Rock Island for the Pottawatomie Light, located on the island's north end. 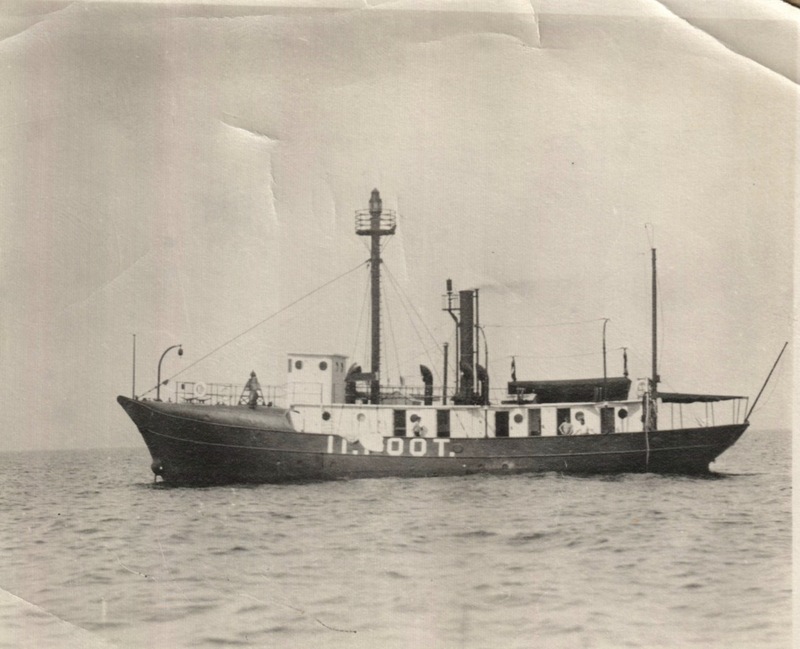 According to the vessel data sheet Eric supplied (which he obtained online from the Alpena County Public Library) the Hyacinth transferred to Coast Guard command in 1940. Then in 1946 it served as a construction vessel for the Lyons Company of Whitehall, Michigan. That company installed a new 900 hp GM diesel, and in so doing it may have attracted the attention of Cap Roen of Sturgeon Bay. In 1956 he bought the Hyacinth and removed the engine, and put it into his tug John Purves (now a restored museum ship at the Door County Maritime Museum in Sturgeon Bay). The following year the ownership of the old hull was shown under Sturgeon Bay Iron & Metal Company (Roen's next door neighbor along the waterfront). It was scrapped. Such a lightship was not uncommon for marking major shoals or turning points for shipping in the nation's waterways. This one was built in 1912 by Racine Truscott Shell Boat Company of Muskegon, Michigan. (80 ft. x 21 ft. x 10 ft.) It was built specifically for lightship service, with a 100 hp steam engine. During its early service it was sunk, Nov. 10, 1913, on Waverly Shoal in Lake Erie, with a loss of six lives. The vessel was salvaged, then beached in Buffalo, and later towed to Detroit where it was refitted. In 1924 it was positioned in northern Green Bay at Eleven Foot Shoal. We can assume it was some time after being assigned to upper Green Bay that this photo would have been taken by Thordarson. Last Friday I published information on this site about a Rock Island photo album given as a gift by C.H. Thordarson to a friend, H.R. Holand. One photo showed a tower on Rock Island that appeared to be located on a high bluff of the island's interior. When was it built, why was it built, and how was it used, and what happened to it? These were questions that arose from that photo, and the only information I was able to obtain was from retired Rock Island State Park manager Kirby Foss. He said it was a survey tower, and that the location had never been found. Eric Bonow responded with what appear to be answers to most of those questions. Eric sails as Mate for the Interlake fleet, has a degree in "industrial archeology," and worked for a time with a survey company in the Superior, WI area. His research and emailed response offered the following information, which I'm reprinting word-for-word rather than attempting to summarize. "Thank you for the blog entry on Rock Island. Every so often you throw down the gauntlet, so to speak, and I have to pick it up. Here goes. What you say regarding the original land survey of the Door County area being done very early is true. For the most part, those guys hacked their way through the woods, setting section corners and the like. However, the U.S. Lake Survey did their work by triangulation, and they had a series of stations covering the midwest, and they tied these stations in to other networks which covered the country. There were orders of stations. A First Order Station would be used in the triangulation through from one point to another. First Order surveys were of very high accuracy, and had fairly long legs. There were also Secondary and Tertiary Surveys (and monuments) to map out local areas. The legs of these triangles were shorter, and consequently more stations were established. These surveys led to the production of the charts we still use today. "It so happens that a First Order Station was established on Rock Island in 1864. In the Annual Report of the Chief of Engineers for 1902 the U.S. Lake Survey positions for all of these stations are given. From the Rock Island station azimuths are given to the stations at Door Bluff, Bark River and Peninsula Point. That meant that towers had to be visible at these points as well. Unfortunately the map which accompanied the report was torn off in my copy and the part showing these stations is missing. These stations were used more that once. For example, in the report that I have (which lists all these stations), there was, in 1901 a resurvey of the Apostle Islands. In this report the writer enumerates the methods used, types of stations established, etc. Consequently, if a person had the time (I don't) or the inclination (I do) to look through other reports, the last probable use of the tower on Rock Island could be determined. The monument has been in use since its establishment in 1864, and a current datasheet on it is attached. I've plotted the position on a map and included that as well. With this information, it would be a simple matter to enter the coordinates into a hand-held GPS and take a metal detector along and find the monument. According to the info, it is buried 3' below the ground, mostly in an effort to protect it. Once the monument is found, it would be another simple matter to search in a radius around it to see if any remains of the base of the tower exist. I would guess that the tower was removed so that the material could be used elsewhere. However, these towers had to be very stable so some sort of base must have been constructed. As an aside in this, First Order monuments are still established, but it is done with a GPS unit. The unit sits on a station for a given period of time (usually pretty long), and then the electronic record is taken into the office and a computer post-processes the info an comes up with an accurate position. 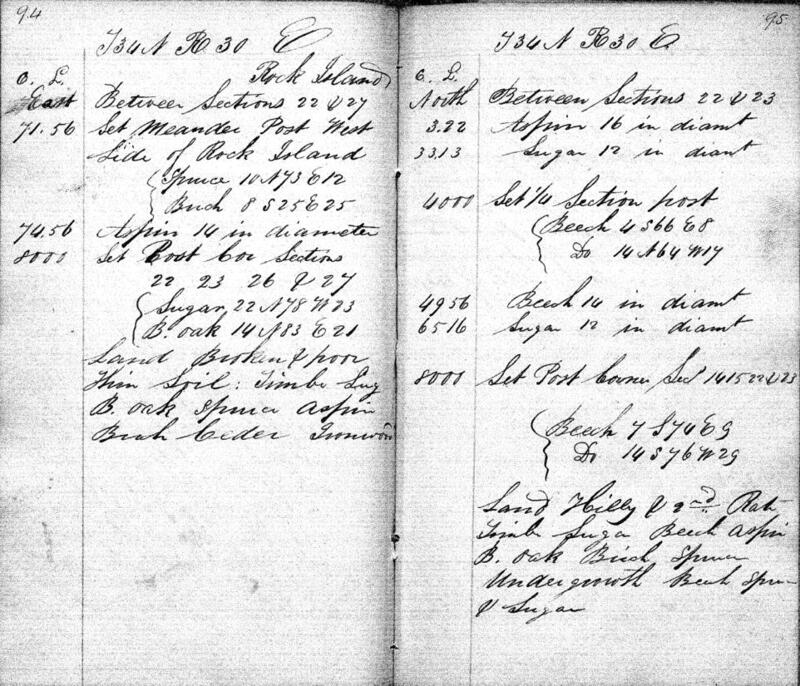 "To digress a little, since section 23 of T34N, R30E lies entirely on Rock Island, I looked up the original survey notes and plat which were done in March - April of 1835. According to the notes, this line was run north from the SW corner, and posts were set at the W 1/4 of section 23, and then again at the NW corner. The south line of the section was run, and points along it were noted, such as where they encountered a swamp, and when it was left. I've included those notes as well. "Since the US Lake Survey used triangulation to set their monuments, and the reports tell of the towers and equipment used, I feel pretty confident in saying that the tower shown in the pictures was used by them. This is substantiated further by the continuation of the monument up to present time. It would be a lot of fun to scout out this area and see what's there. Also, since the Public Land Survey ran the lines I doubt that this would have had anything to do with the establishment of the monuments used in that survey. That was an interesting exercise for a Sunday morning and early afternoon (before and after church, and lunch too). Thanks for throwing that out there. I'll have to look over these photos the next time I visit the Archives." "Since those stations were so far apart, I think that they did a lot of that surveying at night. A more clear atmosphere, and then they would have some sort of "something" up there that burned. Of course in 1864 background lights wouldn't be the problem they are today." "Eastman Kodak Co. is preparing to seek bankruptcy protection in the coming weeks, people familiar with the matter said, a move that would cap a stunning comedown for a company that once ranked among America's corporate titans." What does this news item have to do with Rock Island and the album shown above? Likely, nothing, except for the film emulsion or paper, most probably a Kodak Company product. However, there has been for some time an accreditation to George Eastman for photos taken on Rock Island in the early years of C.H. Thordarson's ownership. The connection has persisted, but so far, no hard evidence has come to light to connect Rock Island with the famous creator of every day photo products. Thordarson purchased land on Rock Island in 1909 and 1910, and so we can estimate that the photos in the album were taken some time in the ensuing decade. An interesting pair of photos shows a wooden tower (that I estimate to be in the 50-ft. range) in the high-ground interior of Rock Island. An old fire tower? Not so, says Kirby Foss, recently retired Rock Island Park Superintendent who worked on Rock Island for all but nine of his 33 years of state park service. 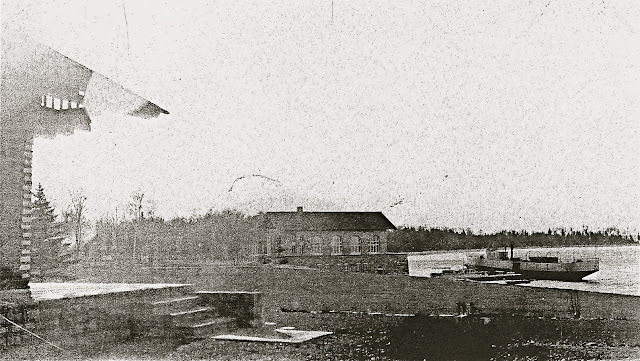 "Phil Peterson referred to it as a survey tower used in the early survey of Rock and Washington Islands. But he never found the tower or the exact location. Neither did Tom Jessen, Phil's successor, or did I. People who've hunted on Rock year after year, who have pretty well walked every spot of ground, they've never seen evidence of the tower. Tom always thought it might have been made of hardwood, the fact there are no remains left."